Sunshine Limo Service offers professional luxury Eugene airport transportation in the area’s most modern fleet of Cadillac sedans (including Eugene’s only Cadillac XTS-L sedans) and Escalades, stretch limousines, or luxury limo Party buses. 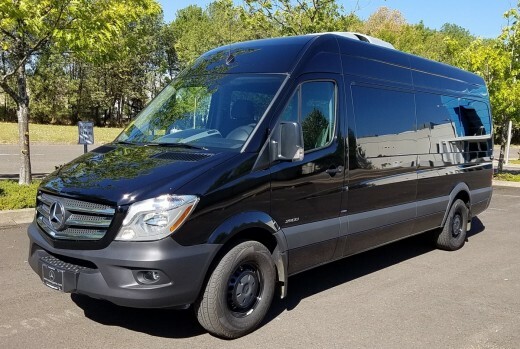 We also offer a 2016 14 passenger Mercedes Benz Sprinter van for larger group transfers at a reasonable rate. You’ll always get a freshly cleaned limo, with a professionally attired chauffeur, always on time. With long experience in transporting many celebrities and VIPs, we have both the equipment and the people to make your trip to or from Eugene airport seamless. **Extra charge for Eugene Airport transfers between 10:00 P.M. and 6:00 A.M. **All Eugene airport trips allow for a total time of 40 minutes from pickup to drop off, or rate goes to regular hourly rate. All prices include Eugene Airport ground transportation fees. **Prices are to/from Eugene area – call 541 344-5466 for quotes to/from other locations** **Extra charge for Portland Airport transfers between 10:00 P.M. and 6:00 A.M.** All prices include Portland Airport ground transportation fees.